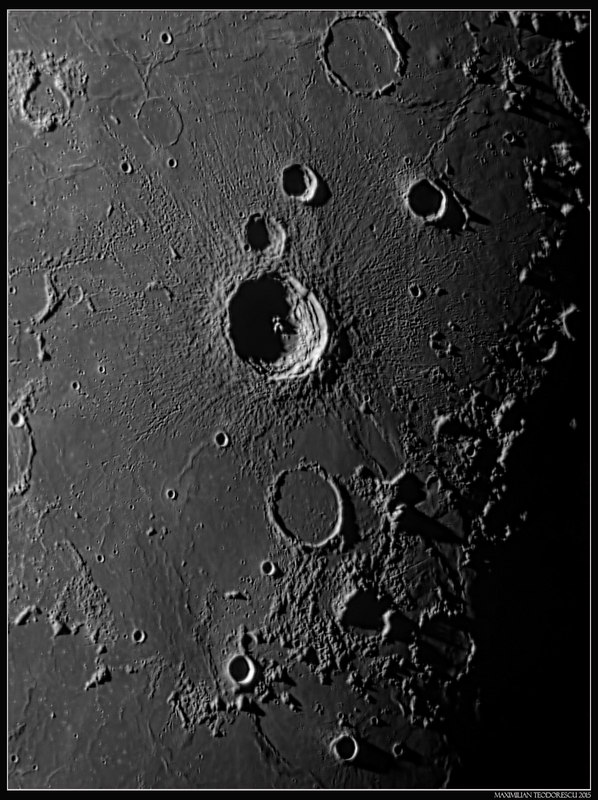 Copernicus is one of the most famous lunar craters. 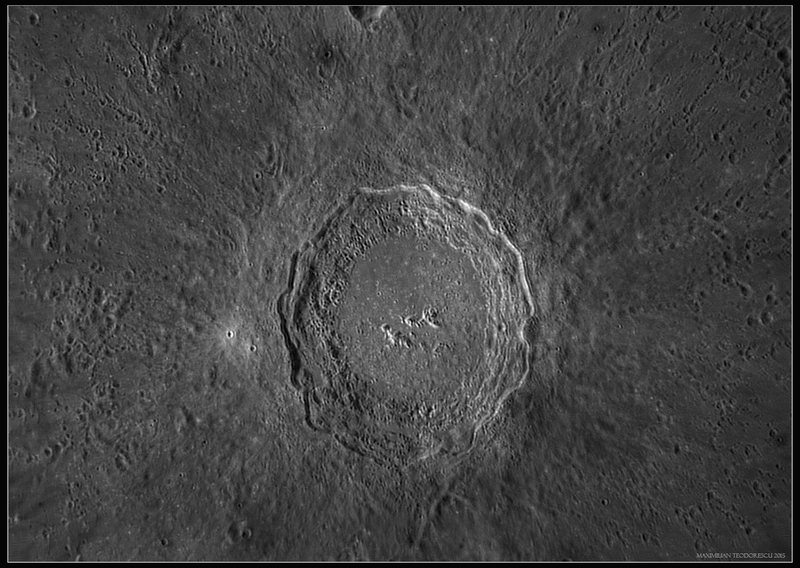 It is quite large (93km), with a sharp rim and it is well placed to have a good view of its floor using small telescopes. It is also surrounded by a complex ray system, due mostly to its “young” age, of only 800 million years. The interesting terraces and the high geologic differences of its floor are relatively easily observed or imaged, but the subtle color differences, which give some extra information about the soil composition, are a bit harder to observe. This is why I’ve tried, whenever the seeing allowed, and during multiple imaging sessions, to acquire different views of this crater. The results presented here show either the “normal” grey view with good surface resolution and in favorable illumination, or the highly saturated colors as viewed during full moon. 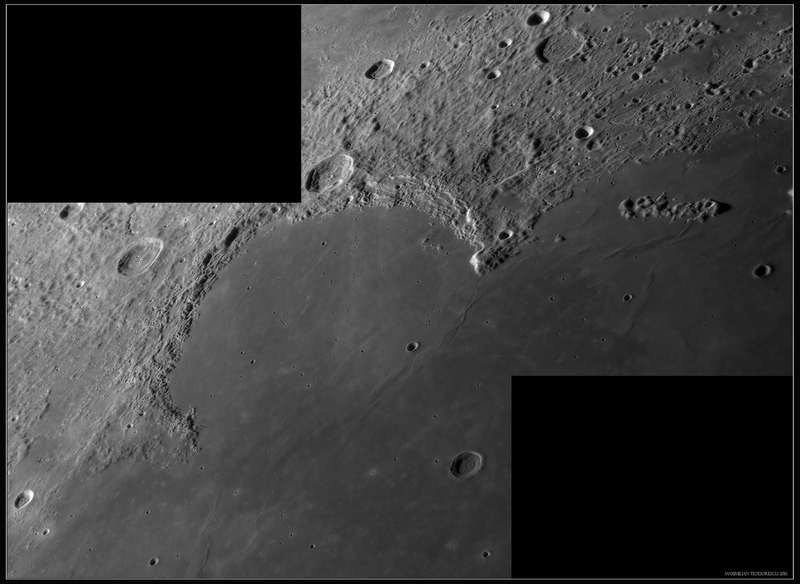 All of the images below were acquired in 2015 with the 355mm homemade Newtonian and ASI 120MM-S camera, either with the Red filter for the High Resolution views, or with the RGB filter set for the color shot. 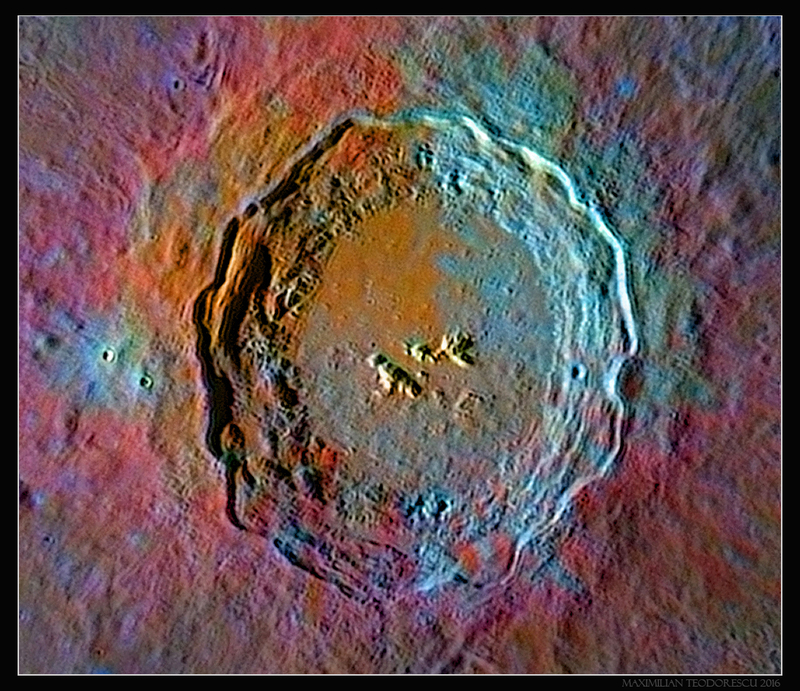 The view shows just how complex the distribution of minerals is for Copernicus, and also proves that the upper-left quadrant of the crater’s floor was filled with lava (orange), corresponding to the somewhat smoother terrain. And to have some feedback from scientific data, I’ve used the LROC online map with the Clementine color-ration layer to see if my result is more or less correct. 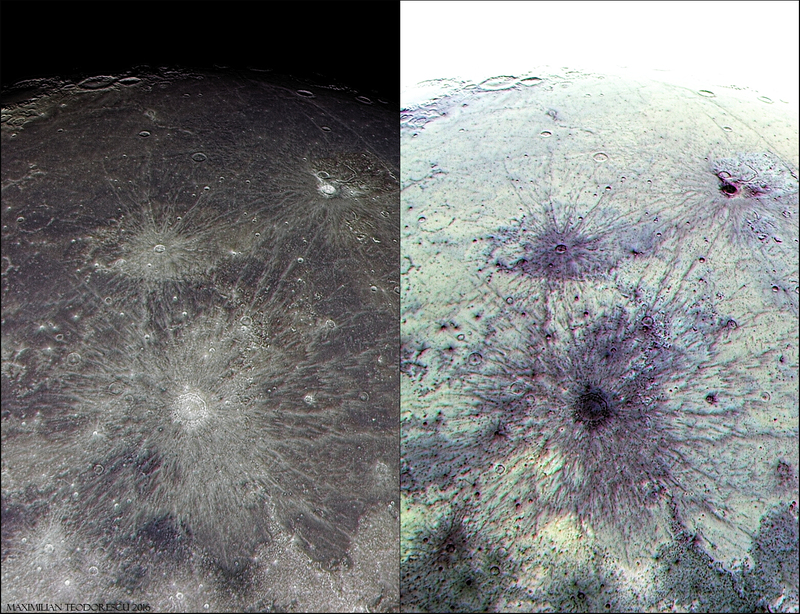 Indeed, the Clementine data was processed quite differently from mine, and that’s the reason I’ve placed the probe’s layer description in the following image (the colors don’t correspond with my result since the lunar probe acquired images using different filters and also the image processing involved a very different procedure). Despite this, some obvious correlations can be made, and the distribution map is basically the same, which is good news for me as an amateur “lunatic”. During this process, I take a few stops at some folders and occasionally I reprocess some of the best shots of those sessions. Sometimes I find some unprocessed data. Both of the above are true for the images shown below, some for the first time on this blog. The seeing conditions for all of the images was in general from 7 to 8/10. A few very fine details are seen in some of the shots. 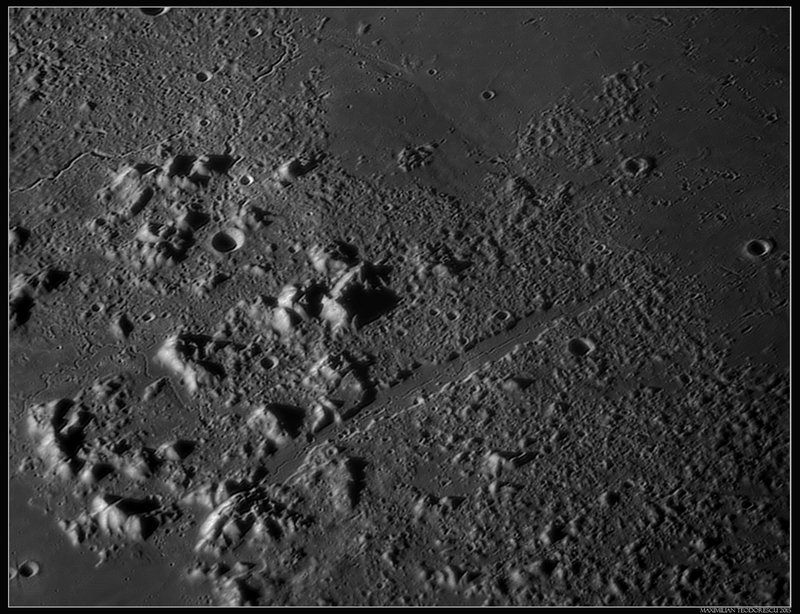 All images were acquired with the 355mm homemade Newtonian and ASI 120MM-S camera with a Red filter. A very small rima is observable in the above image, better shown by the added arrows in the detail below. This rima is actually continuous, but the 355mm Newtonian is not able to resolve it on its entire length. The segment at right has a width of around 300 meters! The following view is one that I’ve posted already on this blog (here), but this time some new information was added to the result. 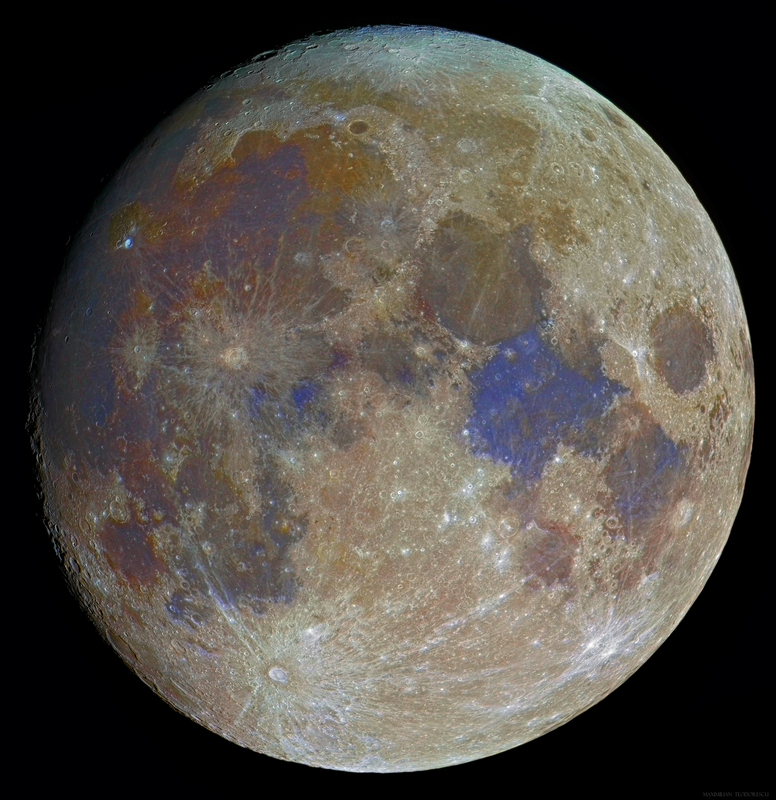 The “new” release is a 150% version from original, processed a bit different to the older versions, and with some color data added from a color Moon mosaic. 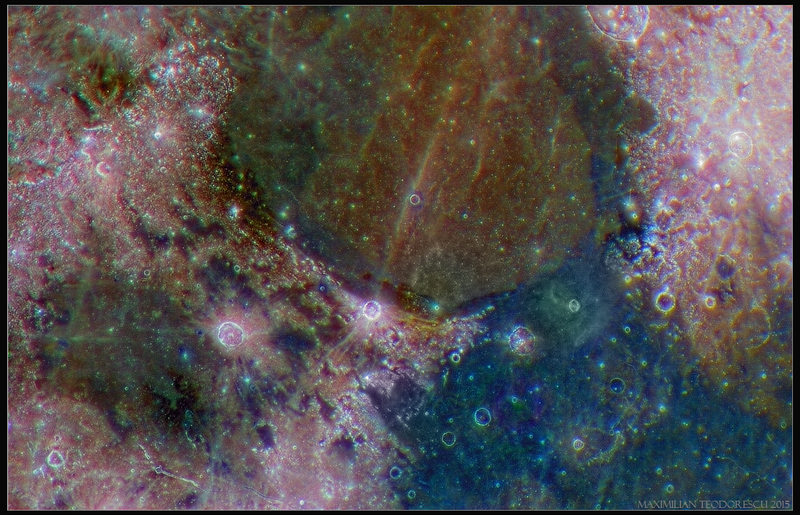 It did take a while to get this result, and it’s still far from what I had in mind, but it does show the two main colors of this area, with most of the bluish-white material coming from the nearby “younger” crater Tycho (which is not visible in this mosaic). 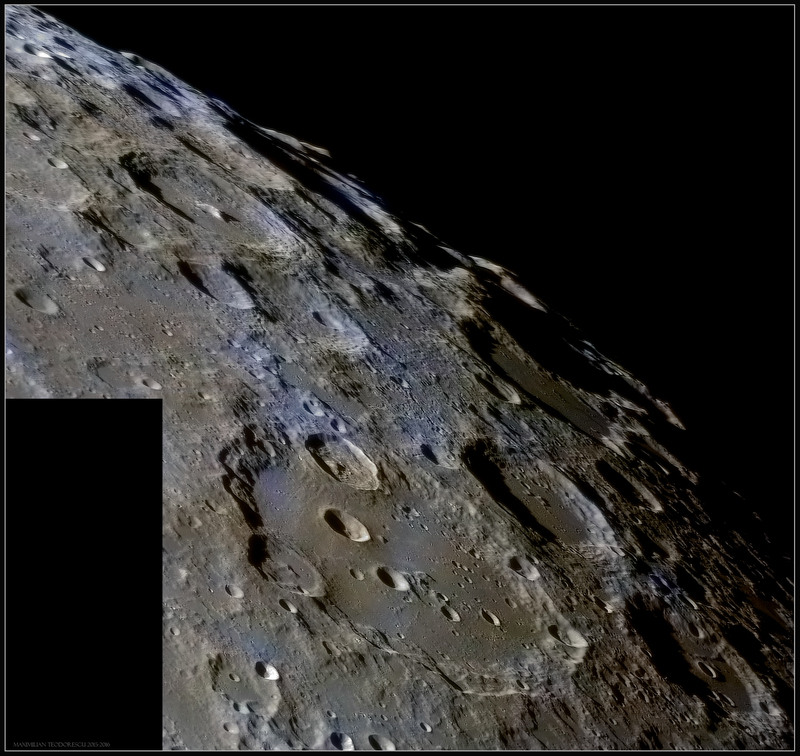 Note the blue material on the floor of Clavius which goes further towards the South; this is part of one of Tychos’s rays (as it can be seen in this mosaic). 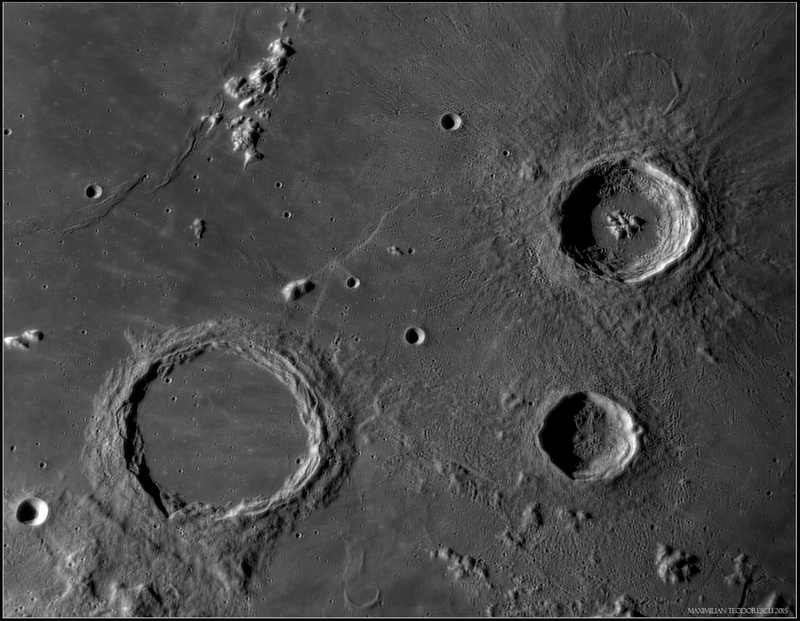 The following image shows the complex ray systems of the lunar craters Copernicus and Kepler. The negative image shows the extent of these systems a little better. The acquisition was done with the 14inch Newtonian and ASI 174MM camera under very poor seeing conditions at -16 degrees Celsius and a lot of fog. The final image is a true color one, with color data from RGB filters. 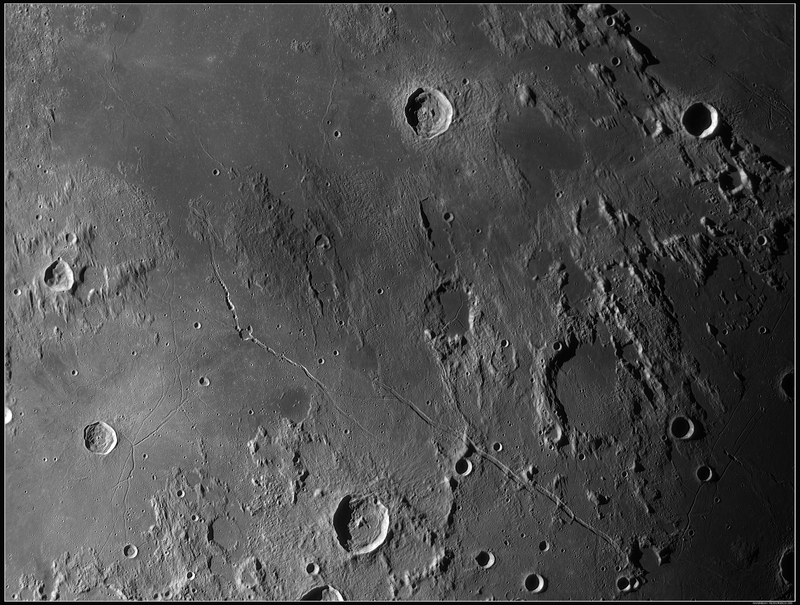 Just finished a lunar mosaic acquired on the night of December 23rd, 2015. It was acquired on the same night the occultation of Aldebaran occurred. The image is a Green channel acquisition using a SkyWatcher 127mm F/12 Maksutov telescope coupled the ASI120MM-S camera and a Baader Green filter. It is a 22 panel mosaic, each of the panels being a stack of 1000 frames. For colors I’ve used the Canon 550D camera. The seeing was rather good, so small details may be observed in the image. I’ve also acquired an RGB sequence of some lunar areas using the Baader RGB filters. These give a better color separation and the end result shows a lot better the subtle differences of the color hues. The image is a 1000 frames stack for each channel, and was combined in LRGB with the Green channel for Luminance. Comparing it with the above result, it is easily observable that for this type of images the RGB filters coupled with a mono camera give a better result. I’m reanalyzing some of the lunar images from September last year, finding some new details in them, and trying to reprocess a bit better to show these details. This time I’ve reprocessed some of the September 4th session results. During that session I had very good to excellent seeing conditions (8-9/10) and good transparency. The instrument used was the 355mm F/5 homemade Newtonian with the Baader Hyperion 2.25x Barlow lens and the ZWO ASI 120MM-S camera with a red filter. Each panel from the mosaics is a 1100 to 1400 frames stack out of 7000. The processing started with the enlargement to 140% from original. This allowed me to reveal the smallest details a little better compared to the old processing. Only AstraImage was used for processing, and Microsoft ICE for stitching together the mosaics. Photoshop was used for the frame margins and signature. Of course, the initial stacking was done using AutoStakkert!2. 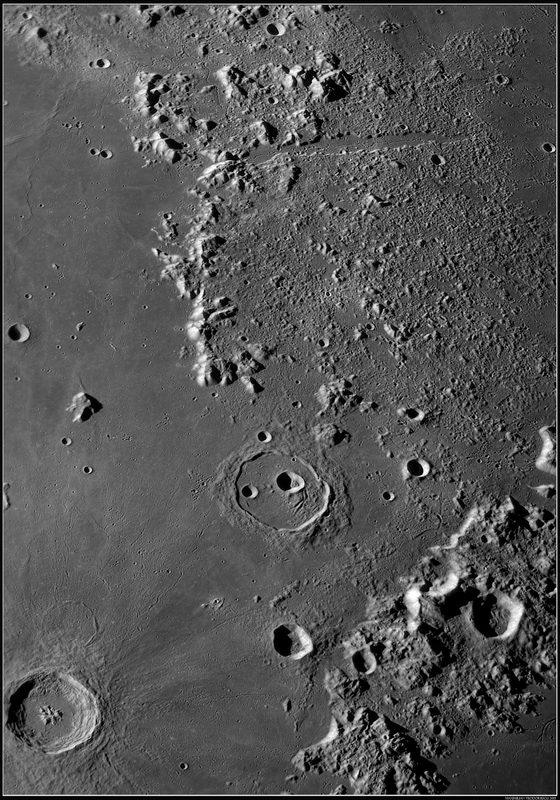 The first shot presents the area of the Hyginus, Triesnaker and Ariadaeus Rimae. The smallest detectable craters have diameters in the range of 450-500 meters. 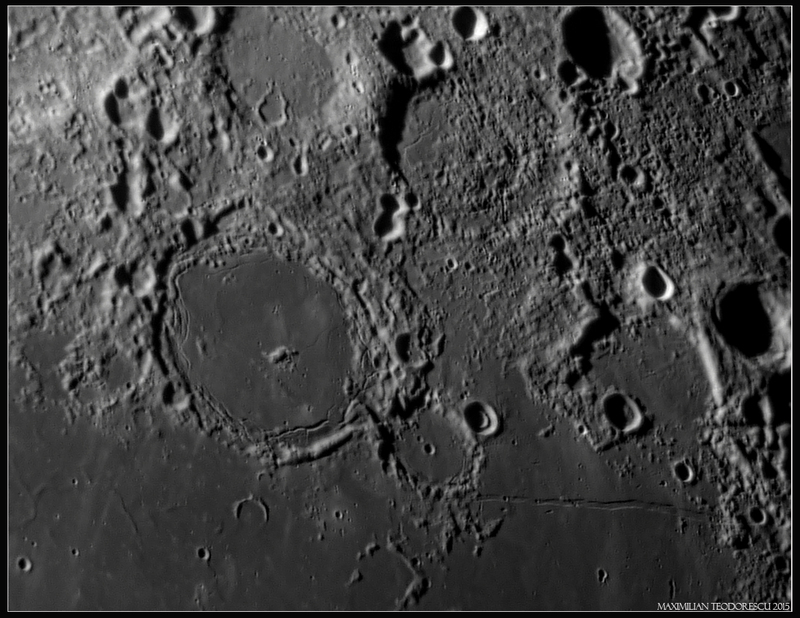 The smallest rimae visible is the one in Boscovich, which I’ve presented in an earlier post; it is visible almost in the center of the image, crossing the flat dark floor of the crater. 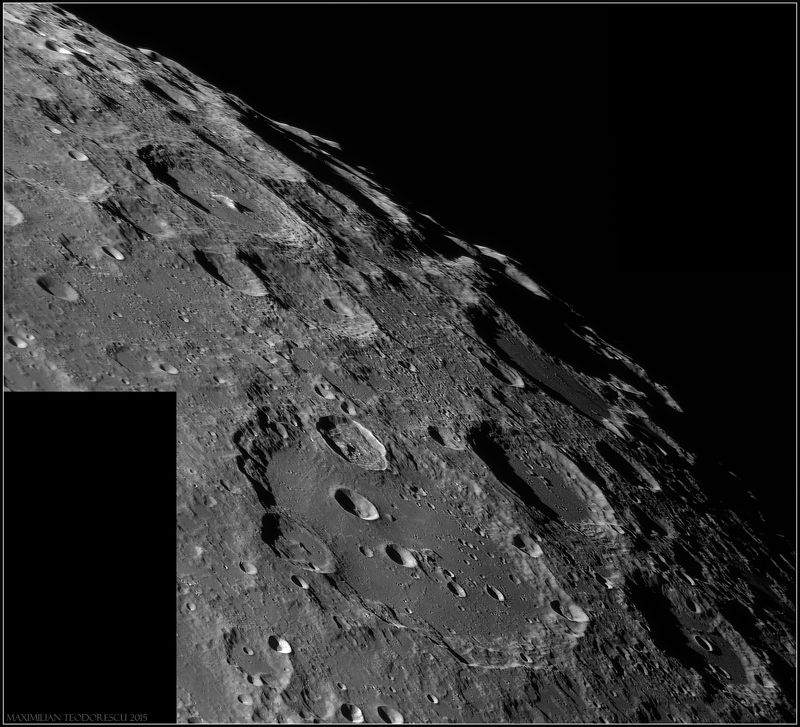 The second image shows the area of Vallis Alpes with its inner rille and the nice-looking crater Cassini. Smallest details are again in the order of 450-500 meters. 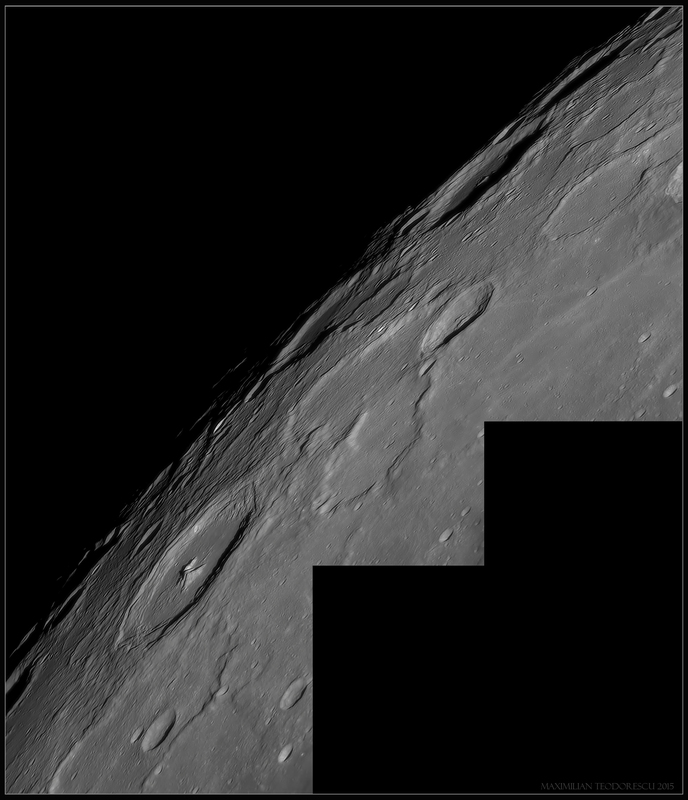 The second part of the results from the December 20th lunar imaging session. The first part can be found here. Same variable seeing conditions and same equipment. And same problems with the dew onto the secondary mirror which forced me to increase the gain on the camera quite a lot; hence the noisy shots. 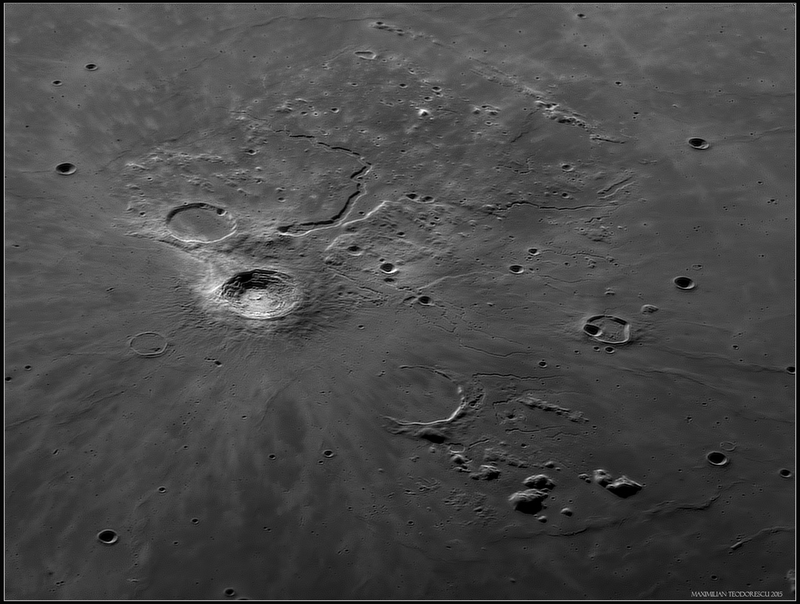 First image shows the crater Copernicus near the terminator and Eratosthenes nearby. 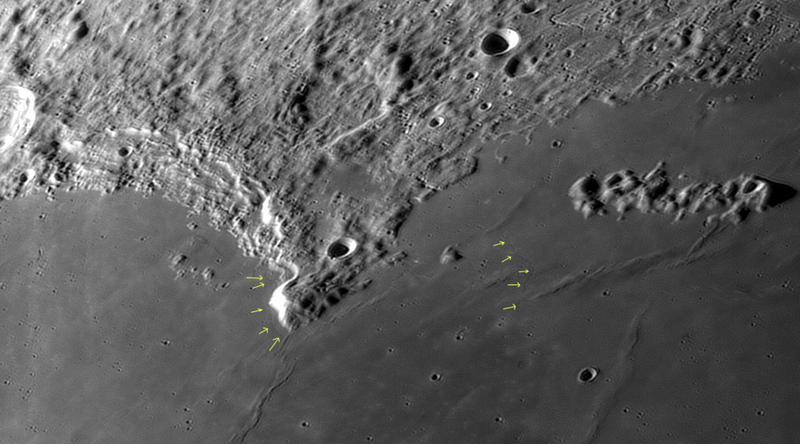 Lots of secondaries and some buried craters are visible between these two large ones.